Please Help Us. Activists Need More Media ! Your contribution directly affects how many stories we can cover. The more activists are seen and heard the more change they can create. 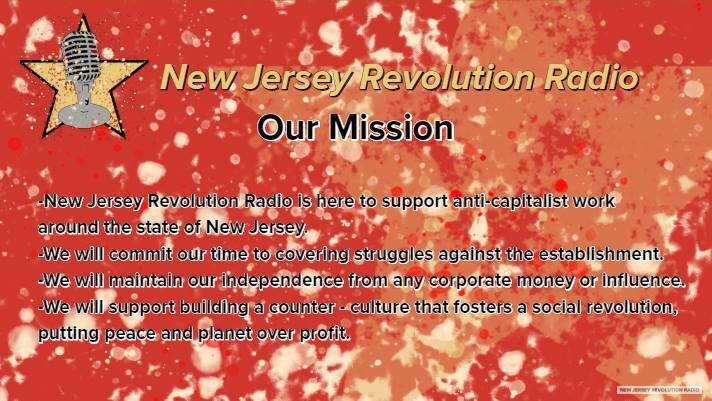 #NJRR is committed to help as many groups that fight racism, oppression, and capitalism as we can. You can be a part of that by chipping in! New Jersey supports artists, authors, activism, and more. If you are working for social justice learn more about being a partner of #NJRR. The Capitalist Tears Mug is pressed in the state of New Jersey by our in house manufacturing. You can enjoy your favorite hot beverage or drink booze when capitalism gives you that kind of day. Either way, your purchase helps fund NJRR#productions. These ceramic mugs have our New Jersey Revolution Radio Logo on the right hand side, and on the left the slogan "Capitalist Tears." Show your indifference to the whining of millionaires who get catered to every day. *We recommend hand washing these for a long life without fading!